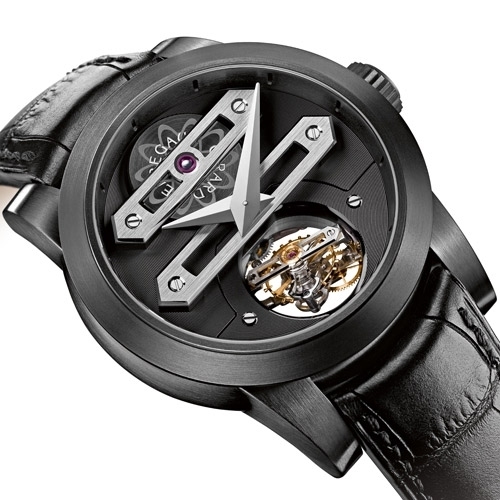 Girard-Perregaux offers an exclusive limited edition of its Bi-Axial Tourbillon. The modern architecture of the iconic movement is enhanced by a black DLC titanium case as well as magnificently contrasting colours and materials. 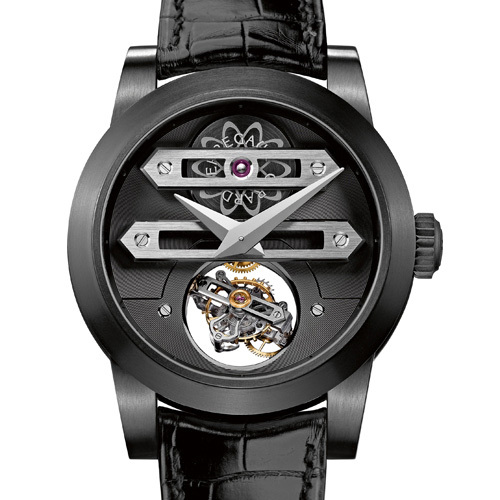 This timepiece is an authentic masterpiece equipped with two concentric cages enabling the regulating organ to perform multidimensional rotations. An inner carriage bearing the balance, the balance-spring and the escapement, spins once around its axis every 45 seconds; while an outer carriage makes a full turn in one minute and fifteen seconds, thus enabling a rotation around a second axis. The second emblematic signature feature is the perfectly aligned architecture of the bridges, reflecting the creations of Constant Girard and his successive research that gave rise to the “Tourbillon with Three Gold Bridges”. 8-piece limited edition.